The No Mar tips, plastic piece at the point of the gun. I have the 15 ga and the 18 ga each gun had 3 of these tips I believe. Anyways I'm down to 1. I'd love to just buy like 40-50 of them but cheapest I've found them is 3$ for a piece of plastic that's smaller than a penny. If that's my only recourse I'll have to take it but just wondering a) if anyone has found them cheaper and b) anyone found a way for them not to constantly slide off. Glue them on but otherwise spend the money. Just ordered my first cordless nailer.. good to know.. I need to take my own advice, the tips on my cordless Hitachis keep ending up in the bag hot glue should suffice. I find hot glue only works on rough surfaces. PL should work. just got it today. how long have you guy owned your guns? I have had mine for about a year. Started off pretty well, but now is so finicky that I rarely use it. Seems like you constantly have to push up on the slide thingy to get the nails to advance. I've had mine for a few months. I'm in love with it. Started divorce proceedings with my wife so I could legally marry this trim gun. About a year. Still problem free. Good gun. I've had my 15 gauge for almost a year now, but have only gone through one box of nails so far. Some guys who use them for production work are reporting early deaths for the dewalts. Hey hey hey! Easy now. She's not "heavy." Sure, she's gotten a little thicker here and there after we first met, but I think that just makes her a sturdier worker. I like her with a big booty. More balanced out and not so top heavy. well ****. I'm hearing some metal on metal on the motor. The box was not damaged but taking it out it didn't seem to be packed right. back in the box and be done with it. Last edited by cedarboarder; 12-08-2018 at 06:14 PM. I've had the 15 ga and 18 ga for a bit over a year maybe. No issues with either one. I use the 15 more I've put 10,000 or 15,000 nails through it if I had to guess. Definitely not that heavy of use. Probly put half that through the 18 ga. I must have got a lemon or a return. 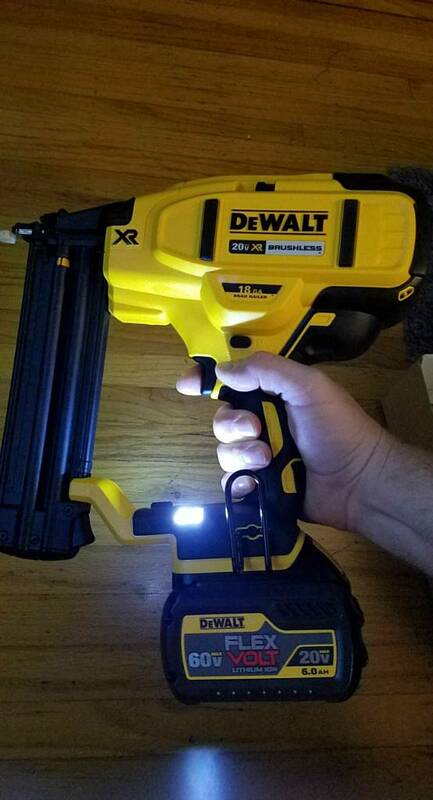 I just picked up the replacement 18ga dewalt nailer from Homedepot and no metal on metal sounds in motor.